The Department of Foreign Trade of the University of Valladolid was presented on Thursday, March 8, 2018, together with the European project TIMMIS Entrepreneurship in the Aula Magna auditorium of the Faculty of Commerce, in a presentation which included a nod to the feminist strike and which culminated with the appointment of the commercial technician, State economist and independent advisor of the ICO José Manuel Reyero as Member of Honor, for his invaluable contributions to Spanish internationalization. The presentation ceremony was sponsored by the Dean of the Faculty of Commerce, José Antonio Salvador, and the opening and closing was given by the Vice Chancellor of Students and University Extension, Felicidad Viejo, along with the participation of Ana Atienza, president of the Chamber of Commerce and Industry of Valladolid; Montserrat Martín-Rujas, technician of the Science and Technology Area of ​​FUESCyL; José Adriano Pires, director of the Higher School of Technology and Management at the Polytechnic Institute of Braganza, and LuísaMaria Pires, representing the business association of the Braganza Nerba district. “On March 8, 1857, a group of women protested for the first time in New York in defense of their labour rights,” began Patricia Sanz, co-founder of the Department, technical director of the TIMMIS Teams and president of Exportun. Department Head and academic director of TIMMIS Teams Beatriz Fernández was with her, both are responsible for a project that seeks to create high-performance teams made up of students from different degrees, nationalities and specialties to come up with ideas that, in the pre-incubation business phase, involve one’s first contact with the professional world. It was the year 2013 when the student Natalia del Villar entered Exportun to do a Master’s degree in foreign trade while developing her TFM ‘Internationalization of the University of Valladolid through the UN.’ This was the grounds of a project that today stands with the financial support of more than one and a half million euros for its execution, in the European Regional Development Framework Interreg-POCTEP. Thus, an initiative -incubated in a mixed Department- was created to promote the study of foreign trade in a transversal way at the University under the prism of public-private collaboration, with professionals linked to the University and the business world who would find, respectively, a way to enrich the students and a place to contribute knowledge and experiences gained from the workplace. The Governing Board of the University of Valladolid approved the creation of the Department on October 26th, 2016. The project received approval on March 8, 2017, one year ago today. The TIMMIS Entrepreneurship project was born out of the need to bridge the gap between the academic and the working world, that is, so that students have the opportunity to build bridges through the best use of their abilities in a work team and bring to fruition their respective Final Degree Projects (TFG) trying to find, in many cases, a practical orientation in this process prior to their jump to the professional field. Thanks to this, the members will be able to participate, occasionally, in the pre-incubation of Born Global companies, focused on the international market and with room for growth. The TIMMIS label reflects the nature of these work teams: they are Transborder, Inclusive, Multidisciplinary, Multicultural, International, and Sustainable. Each of them will have a sponsoring body and two mentors, one being the internal mentor, belonging to the team’s sponsor organization, who will transfer their experiences and knowledge to the students. And another external mentor, with knowledge and experiences in the subject at hand, who will provide an external vision for the project. In a TIMMIS team several students of typically three to four different degrees work together, and this year we have students from commerce, philosophy, geography, history, architecture, education, law, journalism, English studies and Masters of different disciplines; as well as students of the IPB of Braganza. With this activity, the more than forty participants (whose female representation reaches 60% percent) who will form part of this year’s TIMMIS teams will be driven by their creativity, communication, understanding, and abilities to work as a team, through the practice of values ​​such as respect, discipline, or responsibility, the exercise of emotional intelligence skills such as assertiveness, active listening, or self-awareness, and the promotion of the creation of companies whose DNA contains multiculturalism, social inclusion, and an international vision. In turn, the companies will find, in TIMMIS Entrepreneurship, a tool for the promotion of their Corporate Social Responsibility, through the transferring of their experiences and knowledge to these new generations, and through a firm commitment to the retention of talent in the transborder area. Ten TIMMIS teams make up the formative selection for the 2017-2018 academic year: Medina 21 (promotion of the study of the language in Medina del Campo, with the collaboration of the Language Foundation and mentored by Natalia Martín), Rioseco 21-21 (implementation of an industry in Medina de Rioseco that transforms the crops of the area, mentored by Ignacio Mucientes), Boecillo (attraction of international traditional acts in support of the intra-enterprise of the Casino de Castilla y León, mentored by Rafael Cascales); AEICEHábitat Eficiente (searching for efficient urban planning models, mentored by José María García), AEICE Contract Duero (manufacturing of materials related to construction and habitat, mentored by Enrique Quirós) Duero Douro Románico (fostering the love of heritage from childhood, mentored by Álex Miranda), Education through Audiovisual Image (acquiring knowledge of art and English through short films, with the collaboration of Intrasy Foundation mentored by Jorge Sanz), Ideal Fruits (exploring ways for fruit to reach a wider audience, mentored by Antonio de la Ossa), Protocol (promoting protocol as a tool for the development of social intelligence, with the collaboration of Protococyl and mentored by Inocencio Arias) and High Commissioner Marca España (enriching love for the country in the university environment, mentored by Javier Jiménez -Uguerte). 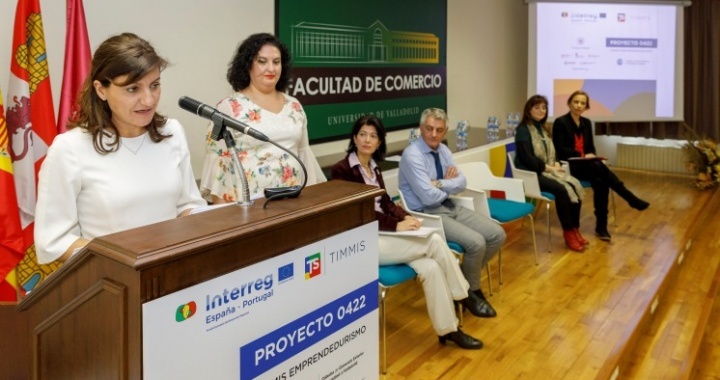 The TIMMIS Entrepreneurship initiative was born out of the need for private companies to promote CSR and it is a public-private collaboration led by the University of Valladolid and supported by the Braganza Polytechnic Institute, the Valladolid Chamber of Commerce and Industry, Nerba, FUESCyL, and Exportun. In addition, it is financed by the ERDF (European Regional Development Fund) through the European program Interregy and contributes to the fulfillment of point 17 of the Sustainable Development Goals of the United Nations (“Partnerships to achieve the objectives”). It also has, to this day, the institutional support of official bodies such as the Consulate of Romania, the Embassy of Cameroon, and the Valladolid College of Economists of Valladolid, as well as the Spanish Chamber of Commerce. Among the professionals who have expressed the suitability of carrying out this project include the Counselor of the International Monetary Fund Antonio de la Ossa, Alin Lucio Villegas, Territorial Director of Commerce of ICEX in Castilla y León; Guillermo Rivas Plata Garay, member of the European Union TalentGroup, and the e-commerce expert and writer Rafael Olano. Among the local, regional and national associations and business groups are ACOCEX, the Exporters and Investors Club, the Vallisoletana Confederation of Entrepreneurs, Infebex, the DO Cigales, Ribera del Duero and Rueda; Secot, the Association of Energy Efficiency Companies (A3e) and the National Organization of industrial companies for internationalization (Amec). In addition, among other local, national, and multinational companies, TIMMIS Entrepreneurship is supported by CARTIF, Iberaval, El Norte de Castilla, RTVCyL, Ibercondor, Everis, BILLIB, FremantleMedia and the international finance consultancy CFI.